Exceptional service and wonderful location. Small and dark rooms on lower level. Good central location in the old town near the Cathedral. Excellent service from the reception area, particularly Maria who has an amazing facility for languages. Room was a reasonable good size. Shower only in bathroom. Perhaps because of its old town location the interior seems a bit dull and tight for space. 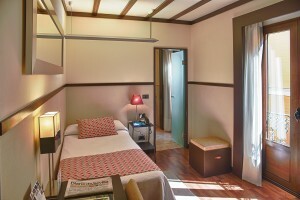 This is a small hotel perfectly situated in the old part of the city. The hotel was clean and comfortable, and the Staff were very helpful and friendly. we had a lovely time at Hotel Alminar. It is in a great position. Particular thanks to the staff who were very friendly and helpful. Very comfortable beds. 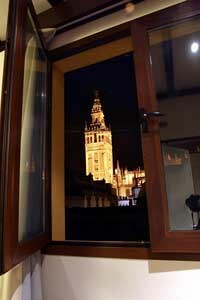 I would highly recommend Hotel Alminar. Wi Fi is patchy and unreliable. Rooms are a little small. 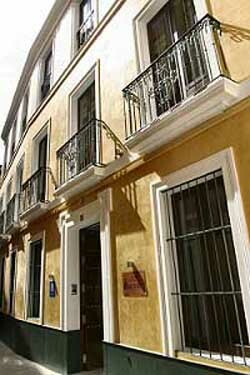 An excellent, small hotel, perfectly placed in the center of the old town of Seville, near the cathedral. Clean modern, stylish rooms and friendly, English speaking staff make this a perfect hotel for a short break. We would certainly visit again. Alminar is a new hotel, opened in March 2005 in one of Seville´s most classical buildings: the one that for more than half a century belonged to Foronda, the leading company in Spain for hand-made bright silk shawls and Flamenco dresses.The building has been restored to be adapted to the particular necessities of a small hotel of only 12 rooms in which attention to detail is a priority in order to offer the guests a cosy space in the very heart of Seville, just 50 metres from the Cathedral and its minaret (or alminar), the Giralda, true symbol of the capital of Andalucía. 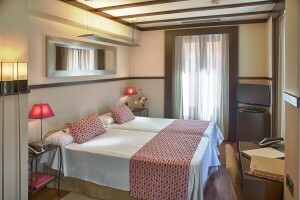 The bedrooms are spacious and are fully equipped with complete bathroom, Sat. 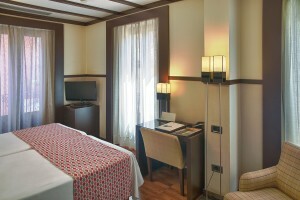 T.V., Phone, Internet access, Mini-Bar, individual Air-Condition and Heating. Even though the position of the hotel is very central, the street where is located is a quiet one so your peaceful rest is more than guaranteed. The continental Buffet Breakfast is settled every morning at the central Sevillian-style patio which has been carefully restored with tiles which perfectly match the original to become the meeting point where to have a coffe or a tea ( it´s on the house ! ) with any other guest or share your view of the city and its people with the hotel stuff. 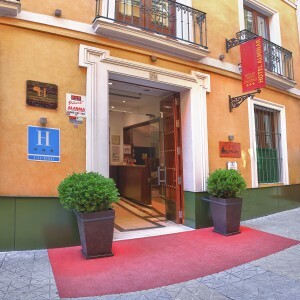 On this point, a special comment has to be made as the hotel has the most valuable information on Seville and its surroundings and some of the unique tips that only Sevillians have. This is the true essence of Alminar because the staff know how and will be pleased to help the visitor to have a memorable stay in one of the most intriguing and beautiful cities in the World. Check-in is possible from 12:00 onwards. 2 children up to 12 years are free of charge per room. Children above that age are considered as adults. Breakfast is available for EUR 6.00 per person per night.